My mother came to visit for a few rainy and chilly days. Most years we see each other only two or three times, usually in the hustle and bustle of holidays or family celebrations, when there is little time for unhurried cooking or conversation. We brewed large amounts of coffee and watched favorite old movies. When the rain died down to a drizzle we went for strolls and browsed in little shops for vintage jewelry. Mostly though, we spent hours cooking and baking. 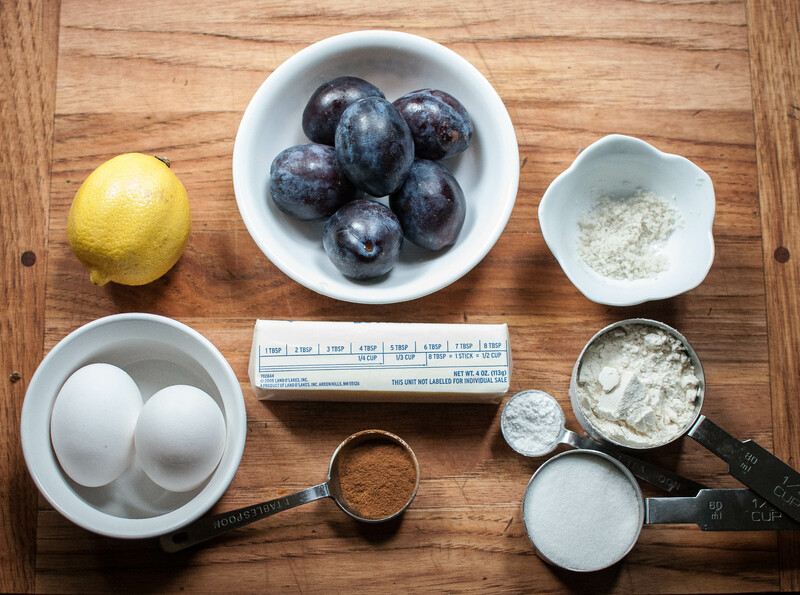 This plum cake pops up in my blog feed from time to time, a classic recipe from the New York Times that bakers love to revisit. Over a few days I saw it pop up on Food52 and Smitten Kitchen, so when my mother and I saw these dark purple plums at the farmer’s market, I knew exactly what we were going to be making. Here is a summary of the recipe from the various places I have seen it. Everything is generally the same recipe to recipe, except that some recipes use 3/4 c of sugar for the batter and some use a full cup. We used the full cup. Pre-heat oven to 350°F. Butter a 9-in springform pan and line the bottom with a circle of parchment paper. In a bowl, whisk together flour, baking powder and salt. 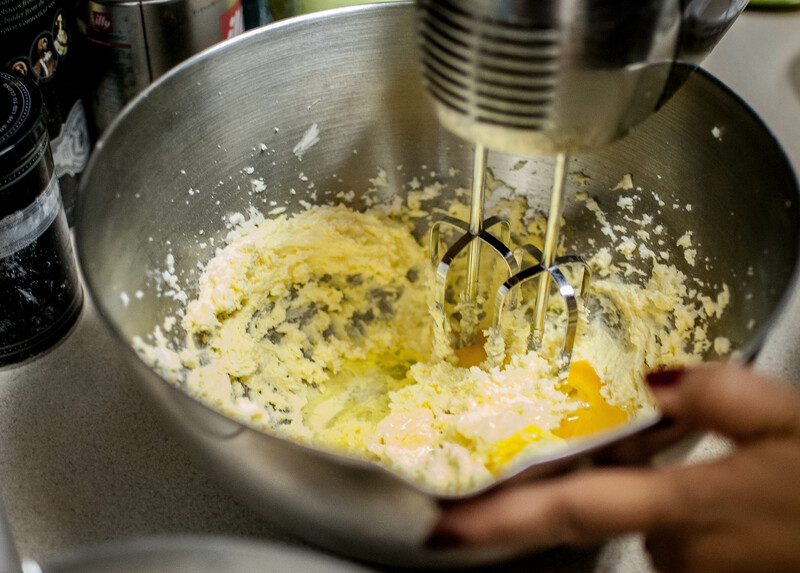 Using an electric mixer and a large bowl, cream the butter and sugar until creamy and fluffy. Add the eggs one at a time, mixing well after each one, then add the dry ingredients and mix until just combined. Spoon batter into springform pan, using a spatula to smooth it evenly around the pan. Set plums on batter, skin side up, so that most of the batter is covered with plums. Drizzle with lemon juice, then sprinkle with cinnamon and remaining sugar. Bake 45-50 minutes, until tester comes out clean and top is golden. Let cool for at least 15 minutes in pan. Use a butter knife to make sure cake sides are separated from pan edge, then remove pan side and slide cake onto a plate. Goes equally well with coffee or ice cream. 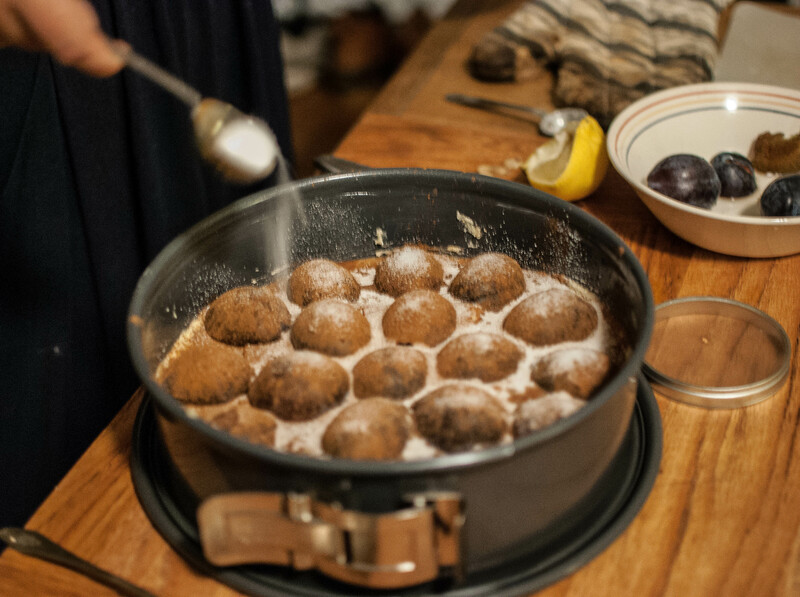 Combine extra sugar and cinnamon in a bowl first, then sprinkle over batter and plums. This is just a tad easier. There may seem like a low amount of batter to a high amount of fruit. Don’t worry, this will take care of itself. 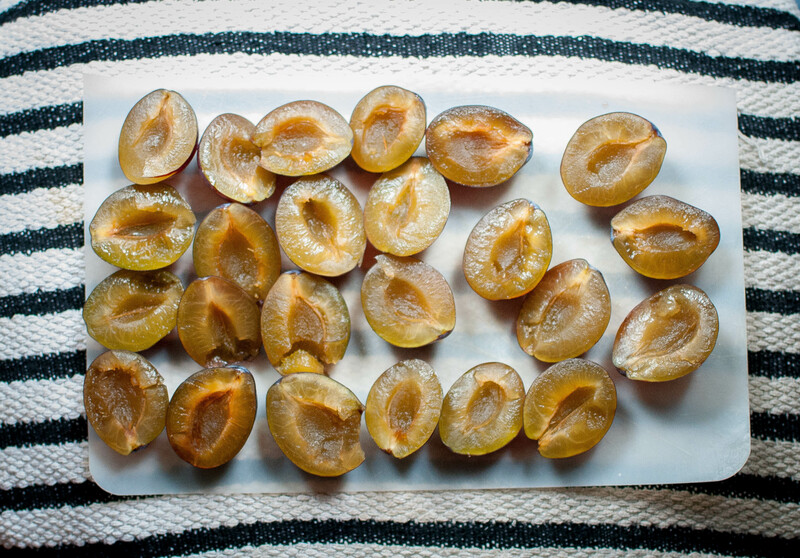 Cut and pit the prunes before you start the rest of the recipe. Depending on how ripe your prunes are, this make take a little longer than you anticipate and its nice to have them ready to go once you’ve made the batter. I’ve seen recipes with and without the lemon juice. We happened to have a lemon lying around and used it. I didn’t notice it much on the day of baking, but the flavor really came through on day two, so if you have a lemon, go for it. Deb recommends saving the cake for day two. 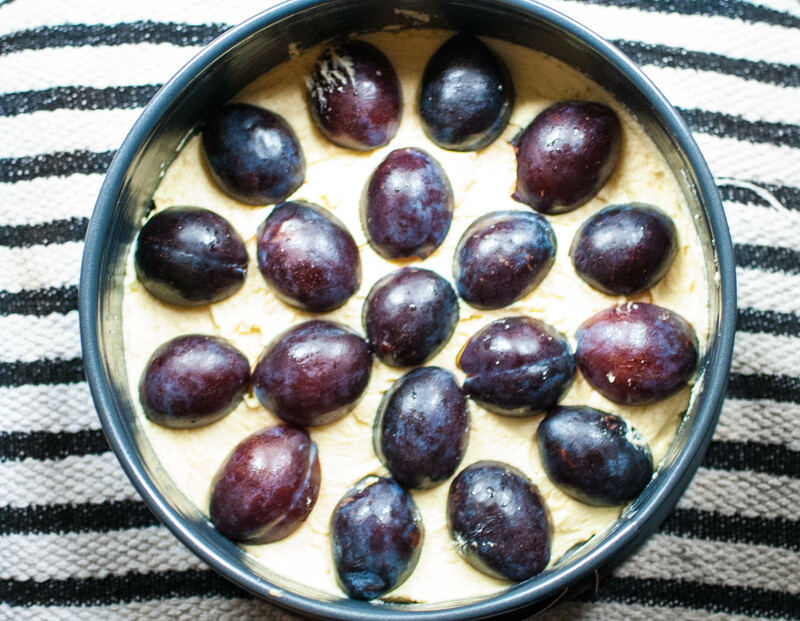 While she is right that the plum juices make the cake more moist and custard-y, the plums themselves are not as gooey and jam-like as they are on the first day. 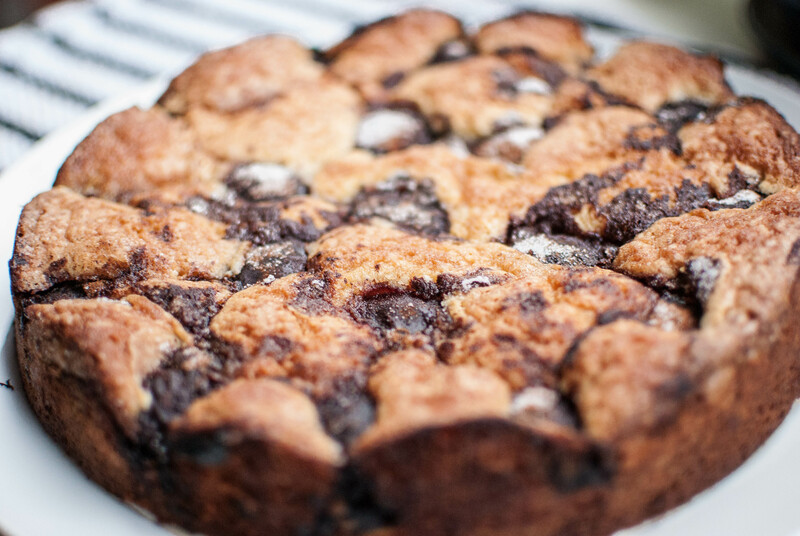 Cake full of jam-like plums is indescribably delicious, so definitely enjoy at least some of the cake on day one. 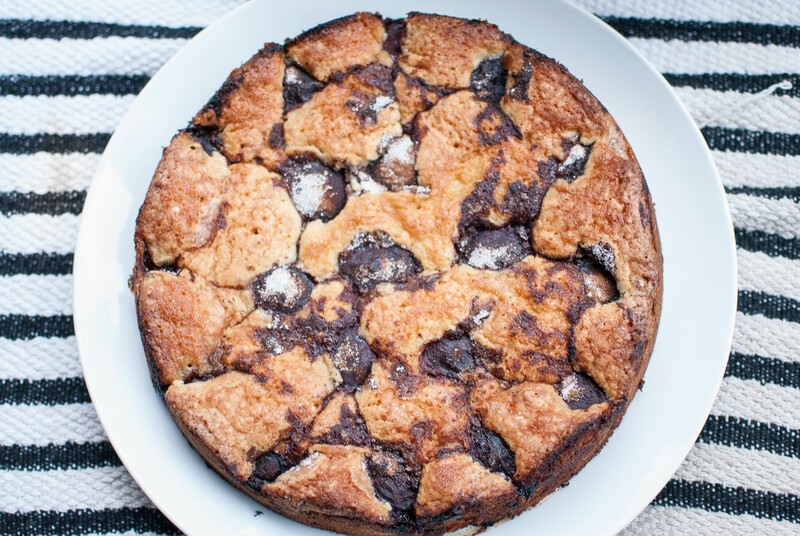 Mmmm, love the big chunks of plums in the cake!